Don’t assume that the Great White North is too cold for the coolness of jazz. Canada, specifically Toronto, has a rich jazz history. Oscar Peterson, Paul Bley, Kenny Wheeler, and Diana Krall would be on Canada’s Mount Rushmore of jazz. These four artists have advanced the genre and helped popularize it all over the ten provinces (and three territories). Canada’s love of jazz has produced dozens of quality jazz clubs. These venues are diverse, but they all entertain and keep the genre alive. There are so many, we thought it would benefit jazz fans if we listed some of the most outstanding. The following list contains the 35 best jazz clubs in Canada. These venues have been chosen because they offer patrons a comfortable and inviting place to enjoy amazing live jazz. We're using the phrase 'jazz club' loosely here. 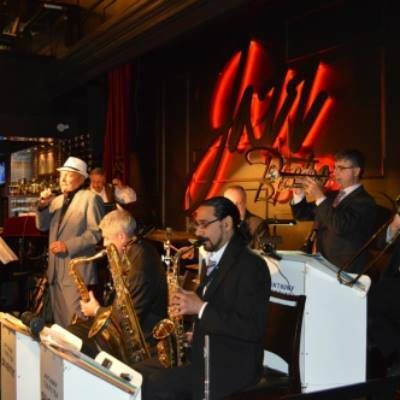 Our list includes traditional jazz clubs as well as restaurants, bistros, and bars that host regular live performances. Venues in Toronto and Vancouver dominate the rundown, but we’ve also included clubs as far north as Edmonton and as far south as Hamilton. If you attend any one of the following establishments, you will enjoy good jazz (and maybe even some great blues music too), a good drink (maybe even a good meal), and a good time. If you love jazz, Italian food, and wine, you’ll love Bucatini. Named after a pasta invented in Bologna, Bucatini frequently welcomes distinguished jazz musicians to its stage. Their kitchen uses the finest fixings, their chefs embrace a “less is more” philosophy, and they have an extensive wine program. Gravity Espresso and Wine Bar is found east of downtown Calgary on the Music Mile. The venue hosts jazz artists, as well as musicians of all ilk, on Friday and Saturday nights. Gravity is a family owned business that’s community minded. They want patrons to come in, grab a cup of coffee (or a glass of wine), and relax. Kawa Espresso Bar offers a variety of coffee experiences including organic and European. They also serve beer and wine. As for live jazz, Kawa invites a bevy of skilled artists to its dais. Jazz artists that have performed at Kawa include Ralf Buschmeyer, Conor Ronaghan, and Michelle Gregoire. By the way, “Kawa” is Polish for coffee. David J David performs at Kawa. Image courtesy of venue’s Facebook page. 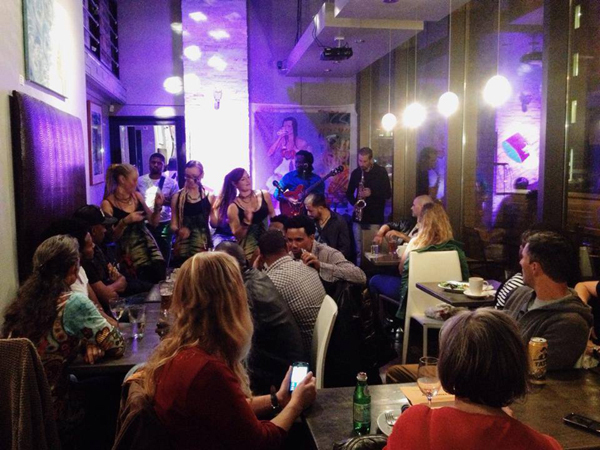 Enticing and soothing, The Wild Fig presents live music every Friday and Saturday night. They schedule enough jazz that fans of the genre should pay close attention to their calendar. Their restaurant serves an eclectic mix of appetite-pleasing meals. The Wild Fig, with its modern décor, is located in the Executive Plaza Hotel. Completely operated by volunteers, Yardbird Suite’s roots go all the way back to 1957. The club went through several locations before moving into its current digs in 1984. It’s one of the few music venues on our list that has a Wikipedia page. 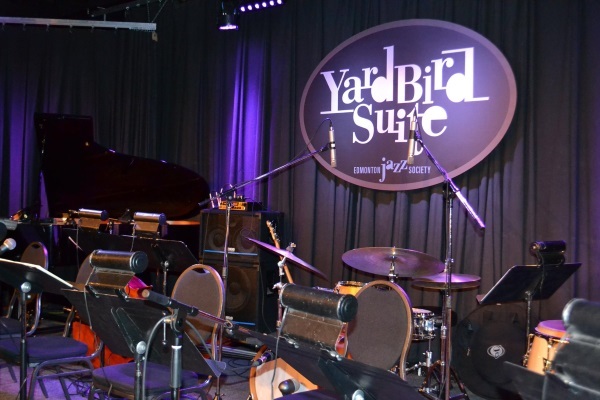 The Yardbird hosts about 75 concerts a year as well as a weekly Tuesday night session. Yardbird Suite before a performance. Image courtesy of venue’s Facebook page. The brain-trust behind Obladee is the brother and sister team of Heather and Christian Rankin. They’ve created a unique wine bar in downtown Halifax. Besides awesome vino, Obladee also serves awesome jazz. In the past, attendees have enjoyed sets by virtuosos like Jake Hanlon, Donald MacLennan, and Martin Davidson. Captivating art hangs on its walls and enthralling jazz music emanates from its stage. Artword Artbar is run by the capable team of Ron Weihs and Judith Sandiford. This unforgettable venue has a welcoming and affable atmosphere. For your various appetites, they serve micro-brews, espresso, and victuals. If it’s Wednesday, you need to be at the Shore Grill and Grotto. They have live music other nights of the week, including the GTA’s best jam session every Monday, but Wednesdays are dedicated to jazz. In particular, The Carson Freeman Diversion. Beyond the live music, the Shore presents visitors with a sophisticated lounge and a refined dining experience. Dièse Onze Jazz & Restaurant is situated in the Mount Royal plateau. It opened in 2007 and has quickly become one of Montreal’s best live venues, regardless of genre. 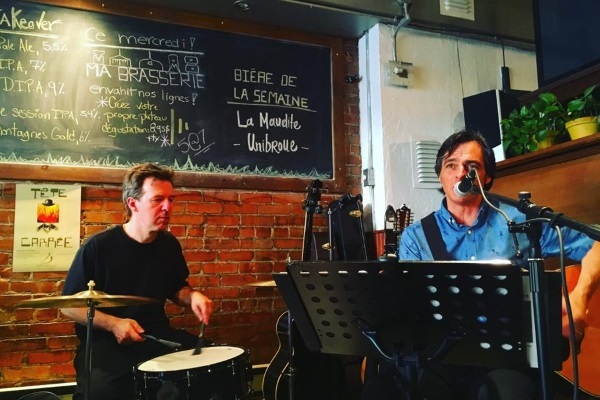 Dièse Onze is a genuine jazz club that hosts at least one show a day, sometimes two. If you’re hungry, Dièse Onze has a delectable menu of light fare. Modavie is Montreal’s hottest jazz club. And why not? They have everything. We’ve already mentioned the live jazz, but the other reasons to check out Modavie include their innovative pasta dishes, first choice meats—lamb is their specialty—and an impressive wine list. The décor and staff create a mood that’s perfect for even the most ardent jazz aficionado. Jazz musicians performing at Modavie. Image courtesy of venue’s Facebook page. Sheila Jordan, Kurt Rosenwinkel, Donnie McCaslin, Ingrid Jensen, and David Binney are just a few of the musical dignitaries that have appeared at the Upstairs Jazz Bar & Grill. One of Canada’s top jazz clubs, Upstairs has a robust menu, a terrific sound system, and an informal vibe that’s conducive to enjoy the dulcet sounds of jazz. If you’re a fan of the music, this venue should be on your list. 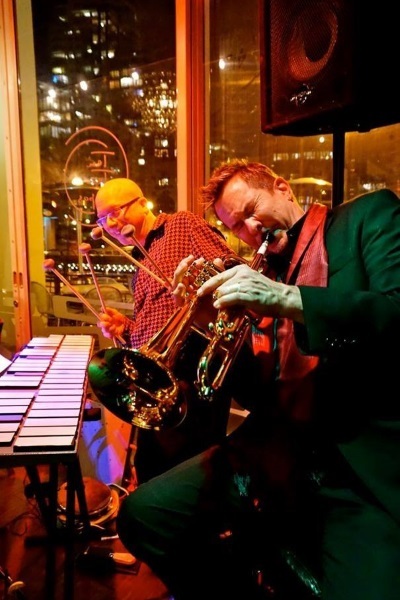 Do you live on the north shore of Burrard Inlet and want to enjoy some hot live jazz? If you answered yes, check out Café Orso. It’s a charming European-inspired café that serves fantastic food, craft beer, and 49th Parallel coffee. They frequently host a jazz night (see their website for details). Their jazz nights are very popular, so make sure you contact Café Orso to reserve a table. 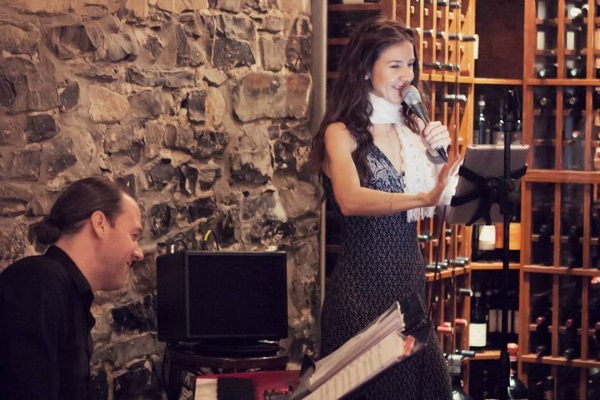 Vineyards Wine Bar and Bistro Ottawa hosts live jazz every Sunday, Tuesday, and Wednesday night from 7pm to 10pm. Artists that have performed at Vineyards include Jim McCreavy, Peter Liu, and the Yves Laroche Duo. Vineyards delivers 300 wines, 100 brews, and 30 brands of Scotch. Best of all, there’s never a cover charge for the live music. 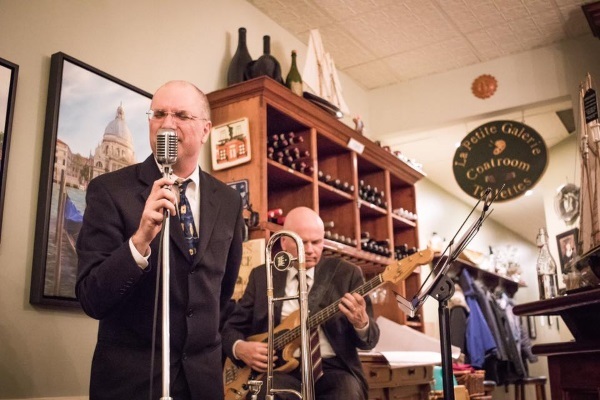 Gallery Bistro puts together a must-attend jazz jam every Monday night. Additionally, they book live music arts on several of the remaining nights. Visit their website for a complete rundown. The bistro is run by Rainer and Helen Daniels. They’ve created a popular spot where art, food, friends, and music come together in perfect harmony. Thursday is the night to be at Le Sacrement. Live music, frequently from the world of jazz, fills the air. Of course, if you want a refreshing beverage, then any night is a good night to visit Le Sacrement. This friendly neighborhood bar has been around for more than two decades. They have a beautiful terrace, a mural featuring a stoic bear, and exposed brick. Jazz musicians performing at Le Sacrement. Image courtesy of venue’s Facebook page. Bushwakker Brewing is said to have a ghost. Don’t worry, it usually leaves patrons alone. A weekly occurrence at Bushwakker is their Monday Night Jazz & Blues event. The music begins at 8pm. This free concert is the only one like it in Regina. Bushwakker Brewing opened in 1991 and is located on the main floor of the historic Strathdee Building. Mahtay Café & Lounge makes our list based on The Twilight Jazz Series. Established in 2011, this series has brought hundreds of prominent jazz musicians to the area. Some of the performers were Mark Lalama, Barbra Lica, and The Heavyweights Brass Band. While visiting Mahtay, make sure to explore their first-rate food, beverage, and coffee. Gate 403 is a destination if you love live jazz (and sometimes live blues). They schedule live performances every day of the week. Come for the tunes but stay for their tasty menu—they even have desserts. Wet your whistle with their assortment of wine, beer, cocktails, and martinis. Gate 403 combines the best parts of an upscale local pub with the best parts of an upmarket piano bar. If we wrote this article in January, Hugh’s Room Live wouldn’t have been on it. They closed in January after 16 years of operation. The venue re-opened in April as a non-profit thanks to the hard work of dedicated volunteers. Seeing a jazz performance at Hugh’s means you’re directly supporting Toronto’s live music scene. Jazz Bistro occupies the former site of the Senator Steakhouse. You’ll find it near Yonge-Dundas Square. This world-class venue brings top jazz artists to Toronto six nights a week. The tremendous musical experience they offer to their clientele is enhanced by sophisticated, but casual cuisine; a hearty wine list; and a warm, welcoming environment. Colin Hunter & The Anthony Terpstra Seventet performing at Jazz Bistro. Image courtesy of venue’s Facebook page. Lula Lounge brings a bevy of astounding jazz artists to Toronto. They also bring artists specializing in world music, Latin, reggae, and salsa. Besides concerts, you’ll also find a bar and restaurant. They will teach you how to dance too. Check out their website for a full schedule of classes. Keep in mind, if they don’t have a live act, they don’t open. That’s another reason to peruse their site. Old Mill Toronto is a hotel with 57 rooms and suites, nestled in the handsome Humber River Parklands. It makes our list because of the Home Smith Bar, one of the most popular, and best, jazz clubs in T.O. You can enter Home Smith Bar through the Old Mill’s lobby. This extraordinary jazz venue is open every day of the year. Reposado Bar & Lounge is dedicated to booking top acts—many of them talented jazz cats. There’s a lot to love about Reposado, but one of their most endearing qualities is their cover charge. All their live music events are “pay what you can.” That means even when your wallet is light, you can still support live jazz. The other thing to love about Reposado is their huge selections of tequilas. The Rex Hotel Jazz & Blues Bar is one of a handful of establishments that’s legitimately in the running for Toronto’s jazz mecca. That’s saying something because Toronto has a rich jazz history. The Rex’s motto is "More Great Jazz than anywhere else, all the time!" That’s not marketing. That’s the truth. Also at the Rex, you’ll find draught beer, retro décor, and a causal atmosphere. Jazz Ensembles performing at The Rex Hotel Jazz & Blues Bar. Image courtesy of venue’s Facebook page. At the Blue Martini, you can dress up or you can dress down. You can bring a date or a group of friends. You can order a meal from their sister restaurant, Francesco’s Ristorante Italia, and a martini from their bar. Blue is not only a quintessential jazz club, but it’s quintessentially “West Coast.” Their outdoor patio offers a spectacular view of Kits Beach. Across from BC Place, and around the corner from Rogers Arena, you'll find Frankie's Italian Kitchen & Bar. Before we recognized this venue, it was written up in DownBeat Magazine as one of the “Great Jazz Venues of 2016.” On Frankie's proverbial marquee, you’ll find the names of both local and international artists. On their menus, you’ll find authentic Italian dishes. Jazz enthusiasts in British Columbia take note. If you want to experience exciting live jazz, drop in on Pat’s Pub & Brewhouse on a Saturday night. While you’re there, enjoy their quality beer selection, especially Pat’s Classic Lager, and their gastronomical treats. Pat’s was originally called “The Patricia Café.” It was established in 1914. Poorhouse Restaurant is housed in a building constructed in 1910. Just about every piece of furnishing in the Poorhouse, including its 38-foot bar, has a tale to tell. Needless to say, the best story tellers are the jazz artists that grace the Poorhouse’s stage every Sunday night. Only the most talented jazz musicians can trade licks here. Ten Ten Tapas produces live music events every Friday through Sunday. Many of the artists booked are renowned jazz musicians. This is a cozy venue with a breathtaking view of False Creek. As their name suggests, you can get tapas here. Actually, they serve some of the best tapas in Vancouver, B.C. Musicians performing at Ten Ten Tapas. Image courtesy of venue’s Facebook page. Revel Restaurant & Lounge hosts live performances several nights a week. Visit their website for a complete schedule and to see when they schedule artists specializing in jazz. Revel opened in 2008 and is locally owned. Their goal is to bring a bit of the South to the Gastown Neighborhood. Southern living influences both their cocktails and their kitchen. Hermann’s Jazz Club is Victoria’s premiere live jazz venue and has been for more than three decades. The club was founded by Hermann Nieweler and inspired by his love of the genre. His club began at his hotel, the Bastion Inn. It moved to its current location in 1986. 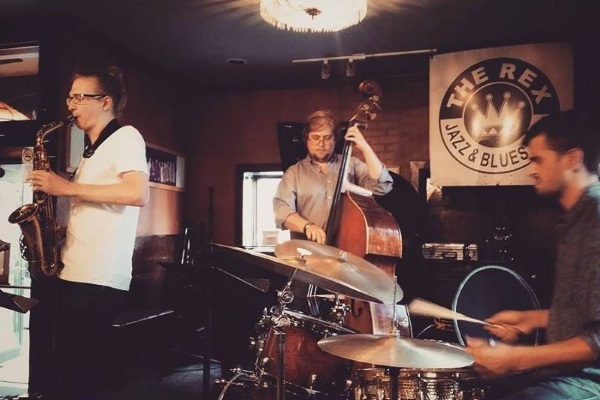 The Tom Vickery Trio hosts a jazz jam every Thursday night. Vernon is about a five-hour drive to the northeast of Vancouver. In this town of 40,000, you’ll find the Vernon Jazz Club. It’s positioned on the second floor of a heritage building in the city’s downtown area. The venue books about 20 concerts a year and can accommodate around 150 patrons. The club is run by the Vernon Jazz Society. The Jazz Room is operated by the Grand River Jazz Society. Their aim is to bring top jazz artists to Waterloo and to support local talent. Typically, local musicians perform on Friday and touring acts perform on Saturday. You’ll find the intimate Jazz Room in the Heuther Hotel. Food-wise, no one serves a more delicious meal than the Nice Bistro. Their Mediterranean French cuisine is beyond scrumptious. It should be, their chefs buy only the best locally sourced ingredients. On most Wednesdays, this nice bistro hosts a nice jazz night. Come enjoy artists like The Zoé Chilco Duo, The Barry Sears Trio, and Paul Grecco & Laura Gauthier. Barry Sears Trio performing at Nice Bistro. Image courtesy of venue’s Facebook page.